When it comes to door hardware, there are a variety of great products that you can offer to your customers. Doors in heated or cooled high traffic areas are frequently left open, meaning that a lot of money can be wasted on electricity. But by simply fitting a quality door closer, the door will close smoothly after each person that walks through, keeping the temperature in that area constant. And if the door needs to stay opened, it can be adjusted accordingly to guarantee fully comfort and versatility. The UAP Architectural Door Closer offers many impressive features. It is size 3 and 2 Valve Adjustment is designed for easy and fast adjustment of the closing and latching speeds of the closer, and the universal application features non handed for standard top jamb. There are two installation options on the door closer. To make fitting easier and more versatile, the door closer can be installed parallel or corner bracket. Ball bearing hinges are supplied ready lubricated by the manufacturer to ensure smooth operation of hinge leaves when fitted to doors. In some cases after installation there will be signs to varying degrees of clear oil seepage. If left for a period of time and particularly in high usage areas such as toilets the oil will combine with atmospheric dust and darken in colour. To avoid the mixture of dust and oil acting as a grinding paste on the ball bearings, which accelerates wear, it is recommended that the product be cleaned periodically. How often the product is cleaned is based on the environment in which it is fitted combined with the assessment of the maintenance officer. It is also advised that the product is lubricated at 25,000 cycle intervals to maintain optimum efficiency of the hinge. However a simple monthly cleaning programme will be sufficient for all low usage areas such as cupboard doors and a fortnightly program is advised for high usage areas such as toilets. This will ensure your products lifespan is maximised and also visually acceptable to the environment in which is fitted. BS EN 1154 classifies door furniture by using a 6 digit coding system. 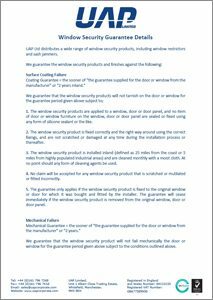 A similar classification applies to all building hardware product standards so that complementary items of hardware can be specified to, for instance, a common level of corrosion resistance, category of use, etc. Each digit refers to a particular feature of the product measured against the standard’s performance requirements. – Grade 1: suitable for fire/smoke resistant door assemblies subject to satisfactory assessment of the contribution of the door closer to the fire resistance of the specified fire/smoke door assemblies. Such assessment is beyond the scope of this European standard (see EN 1634-1). 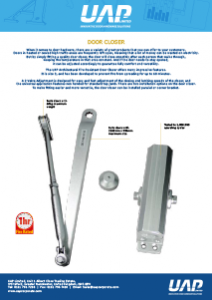 All door closers are required to satisfy the essential requirements of safety in use. Therefore, only grade 1 is identified. – Grade 0: no defined corrosion resistance. – Grade 1: mild resistance. – Grade 2: moderate resistance. – Grade 3: high resistance. – Grade 4: very high resistance.